Powers/Abilities: In comparison to the rest of his body, the cruel and sadistic Pinhead had a disproportionately small head on his broad shoulders. Although he displayed no paranormal abilities, Pinhead apparently had a muscular build (see comments) and was strong enough to hurl a heavy table through the air with one arm. Pinhead was armed with a large knife and a handgun. 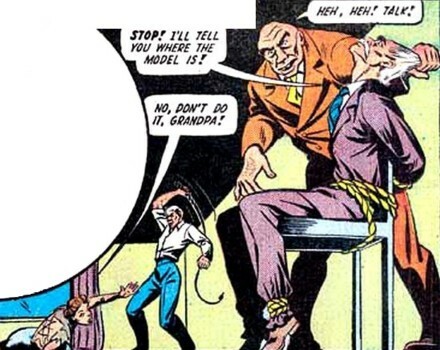 (Marvel Mystery Comics I#52/4 (fb) - BTS) - The past of Pinhead is largely unrevealed (see comments), but at some point the Third Reich sent him and his henchmen to America to steal an "air transformer" invented by an elderly scientist. Pinhead and his men went to the scientist's penthouse laboratory atop a twenty-story warehouse, where they captured the old man and tied him to a chair--but the scientist's blind granddaughter managed to escape, so Pinhead sent one of his henchmen after the girl. (Marvel Mystery Comics I#52/4) - While accompanying her Uncle Jim on a drive to the city, Madeline Joyce took a walk in the rain while her uncle ran an errand. During her stroll, Madeline bumped into a terrified blind girl who was running down the sidewalk; the girl begged Madeline to help her, but the pursuing henchman caught up and brutally shoved Madeline aside, then he dragged the girl away--seeing the young lady was in danger, Madeline changed into her costume to become Miss America, then flew after them. 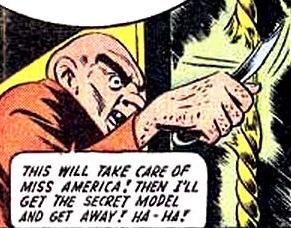 Miss America saw the two enter a warehouse building and she dashed inside after them, but she just missed catching up to them when the henchman pulled the girl into an elevator and the doors slammed shut. As she turned around to go back outside, Miss America was confronted by two more of Pinhead's henchmen. After beating the thugs into submission, Miss America learned from them that the girl had been taken to the penthouse on the roof, so she went back outside and flew to the top of the building. 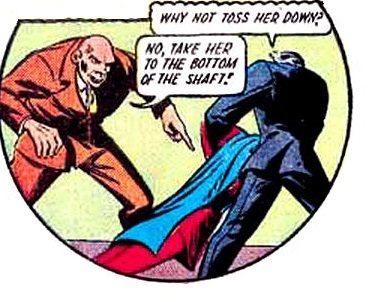 Inside the penthouse lab, the sadistic Pinhead and his men began to torture the girl to force the old scientist to reveal the location of the "air transformer"--but just then, Miss America flew in the window. While the heroine fought his henchmen, Pinhead overturned a table and crawled behind it for cover, then he began firing his handgun at Miss America, but she seemed to move faster than his bullets. As the heroine was busy polishing off one of his thugs, Pinhead picked up the heavy table and hurled it at her from behind, knocking Miss America unconscious. Pinhead had a henchman carry Miss America to the bottom of the elevator shaft and tie her to the recoil spring; then Pinhead pulled out his knife and cut through the elevator cable. But as the plummeting elevator car plunged twenty floors down the shaft, it forced down a stream of air which revived the stunned heroine at the bottom; summoning all her strength, Miss America burst her bonds and rolled from the top of the spring, narrowly avoiding the falling elevator car by mere inches. Miss America climbed from the wreckage in the elevator shaft, pried open the doors to the first floor landing, then went back outside to fly back to the penthouse. Back in the lab, Pinhead had just found the model of the scientist's "air transformer" when Miss America came crashing through a window. While the heroine fought his remaining henchmen and knocked them out one-by-one, Pinhead realized his forces didn't stand a chance against Miss America, so he jumped out of the window and ran across the building's rooftop, then he climbed up a rooftop water-tower in an attempt to jump across to an adjoining building; but before the Nazi leader could make his getaway, Miss America came flying at Pinhead and punched him, and he slipped off the water-tower. As he plunged to his certain death on the street below, the falling Pinhead passed out from fear, but he was caught by Miss America ("I can't let a killer like you die so easy a death! "); the heroine flew the unconscious Nazi back to the penthouse, where she threw Pinhead atop the pile with the rest of his henchmen--by then, the blind girl had freed her grandfather, and the old man had called the police. With the threat of Pinhead over and his victims safe (...and remembering that her Uncle Jim was probably waiting for her to get back from her walk! ), Miss America quickly said her good-bye and flew off before the grateful scientist and his granddaughter had a chance to thank her. Comments: Created by Otto Binder (writer) and Charles Nicholas (artist). 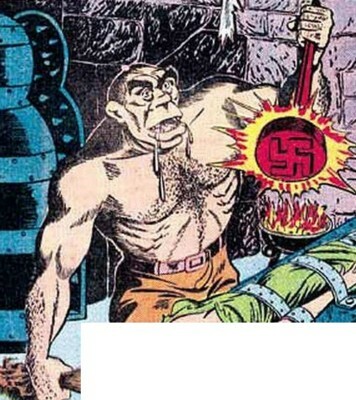 In this story, he was only referred to as "Pinhead" (once by Miss America, and once in a caption), but his real name was revealed in Marvel Atlas#1's profile of Germany. The main image of Pinhead (which depicts him having a little "fun" in a torture chamber as Miss America bursts in) came from the splash-page--this scene never actually occurred in the 7-page story, but it was the clearest image of Pinhead available. Pinhead was never shown shirtless in the story, therefore I'm only assuming from the splash-page that he had a muscular build. Maybe his freakish appearance was the result of an attempt by the Nazis to duplicate Abraham Erskine's "Super-Soldier Serum"--maybe Pinhead was once a scrawny 98-lb. weakling whose body got bulked-up in an experimental process, but his head remained at its original size (...somewhat like the condition the over-augmented Power Broker was left in, but not quite as extreme). 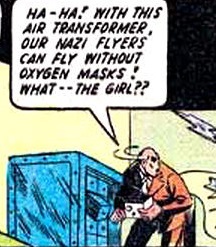 I'm guessing that "air transformer" was some kind of revolutionary oxygen-filtering device. The elderly scientist had a lab in the penthouse atop a twenty-story warehouse building. He built a model of an "air transformer," which Pinhead and his men were trying to steal. The girl was the scientist's granddaughter (possibly he was her legal guardian), and she was blind. 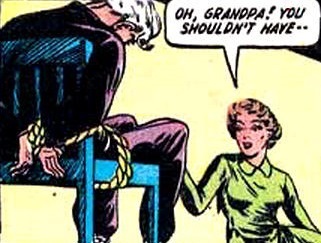 Both had been threatened by Pinhead and his henchmen when they came to the scientist's lab in search of the "air transformer"; while the elderly scientist was tied to a chair, the girl managed to escape and she unknowingly alerted Miss America of their plight. Both the scientist and the girl were eventually rescued by Miss America. A model of the device was about the size of a shoebox, and it was built by the elderly scientist. It could somehow supply oxygen at high altitudes, and thus make oxygen masks for airplane pilots unnecessary. The scientist kept the "air transformer" hidden in a cabinet of drawers. Pinhead's superiors in Germany thought the "air transformer" would be beneficial to their war-effort, so they dispatched him and his men on a mission to America to steal it. Pinhead had just located the device when Miss America flew in to rescue the scientist and his granddaughter. Pinhead made his getaway with the "air transformer" and carried it with him as he ran across the rooftop; when he attempted to jump to the roof of an adjoining building, Miss America punched Pinhead and prevented him from doing so.